Despite the title, this is not the story of the three months I had to share a toiletless bedsit with Mitt Romney in Paris in the late sixties. I know you would thrill to the tales of the adversity we suffered – like the time the Bollinger ran out and Mitt had to buy some more, or when the cook took time off for her mother’s funeral in Normandy and we were forced to live without her truffled coq au vin for three whole days. However, I am on holidays and, like most people on holidays, I really just want to tell you what I have been up to. Moreover, jet lag has struck and I am wide awake when I should be having my pre-dinner nap. As such, as another quite warm Lisbon winter day draws to a foggy close, let me take the chance to tell you a little more about our visit to Tokyo. As I may have mentioned, my nephew Charles and his husband Kevin are accompanying me on this leg of my Grand Tour. Kevin is a public health physician – an honourable career that seems to consist entirely of visiting foreign countries for conferences and (if Contagion is to be believed) occasionally peeling Gwyneth Paltrow’s face off her skull. Which is nice. 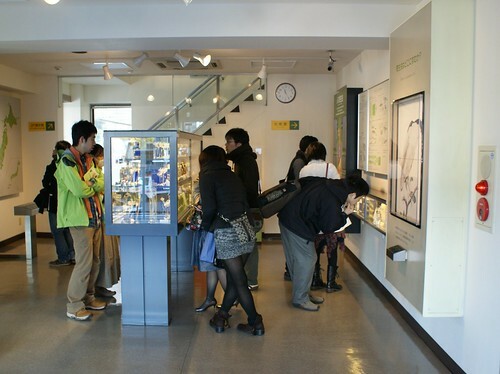 When I met the boys at our hotel in the Ginza, therefore, the first thing they wanted to do was whisk me off to the Meguro Parasitological Museum to look at worms. I do warn you – some of the pictures that follow after the jump are not for those posessed of a weak stomach. The museum is situated in a commercial district in one of those thin little office buildings that the Japanese seem to build everywhere. It’s only a small place, with just two floors of exhibits. 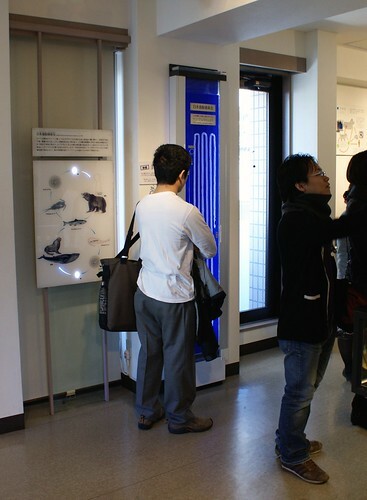 There are a number of interactive displays about the life cycle and geographic spread of various parasites. Unfortunately most of these are in Japanese, but you are never too old to run around pressing buttons and making little lights light up. 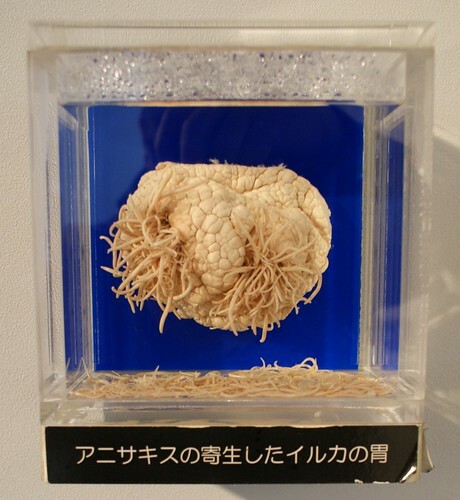 The museum also includes the most extraordinary collection of preserved parasites, such as this little beauty, which I am reliably informed is an Equine Tapeworm (Anoplocephala magna). It truly is a chamber of horrors in jars. There were dozens of things that live in intestines and which might persuade you to never eat (or leave the house) again. There were crustaceans that burrow into the gills of fish and stick their heads out while wiggling their mandibles and making the poor fishy look a bit stunned, and eventually a little bit dead. It reminded me for all the world of Callista Gingrich standing next to Newt. Take your pick which one is which. On the brisk Sunday afternoon on which we visited, there was a constant stream of visitors. Most of them were teenagers (they may have been older, but at my age anyone under 35 looks like a teenager) and most of them seemed to be on dates. 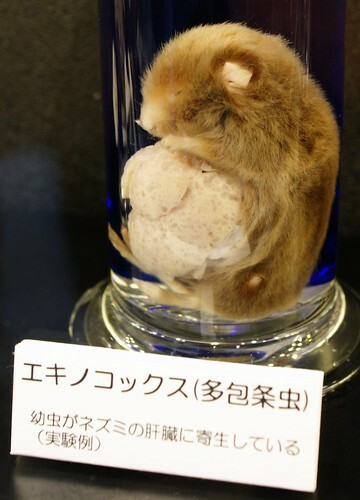 A lot of young Japanese boys seem to feel there is romantic potential in taking your girlfriend to see a dead fox cub with a golfball-sized lump of parasitical goo growing out of its stomach – and given the amount of happy screaming and giggling and clutching of arms that was going on, they might be right. The big winner among the crowd seemed to be the tapeworm (Diphyllobothrium nihonkaiense) seen here. On the wall next to it, on a hook, there was a length of bandage the same length as the worm, which could be stretched out across the room to bring home all the more clearly just how gross the thought of 26 feet of worm curled up in your stomach really is. Best of all, there was a little shop, and I am now the proud owner of almost their entire stock of keyrings, each with a dead Anasakis embedded in plastic. That will make me popular with the grandkiddies, although I’m going to save a few for the Republican National Convention. I can think of several people who deserve the gift of an amoral, parasitic nematode that causes violent allergic reactions. Next up, I’m going to try to do justice to a magnificent chef as I tell you about the best meal of my life. Ummm, thanks. You’ve saved me from bothering w/ breakfast, & possibly lunch as well.